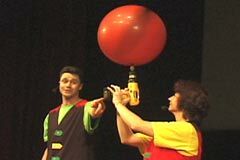 Fizzical Fizzicks is a 50 minute long show for elementary schools which combines the thrill of the circus with the wonder of science. This high-energy show, originally commissioned by the Ontario Science Centre, combines traditional circus props, popular toys and some big surprises to help display and explain the science of motion. 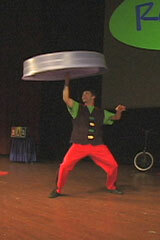 Each type of motion is visually depicted in a fast-paced circus routine. Students participate in short challenges to further enforce the message. This show, which has been performed for hundreds of schools is interactive, engaging, educational, and most of all, fun! 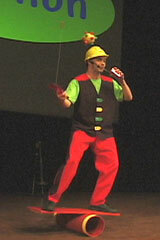 What do you get when you cross circus skills, science concepts and a couple of wacky characters? You get Fizzical Fizzicks – an interactive, action-packed show about the science of motion! This is no dry science lecture! 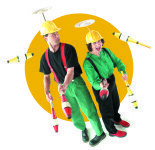 Audiences will be delighted as this dynamic duo performs circus skills like juggling, stilt walking and unicycling; PLUS dozens of tricks with toys like yo-yos, hula hoops and even a pogo stick. There are a few BIG surprises in store as giant, colourful props get involved in the action. Fizzical Fizzicks is based on themes of force and motion. It also touches on other science topics like waves, friction, momentum and air resistance. Fizzical Fizzicks is a show all about motion. There are different kinds of motion. Linear motion is the most obvious kind of motion. It’s when someone or something moves from one place to another. Walking and driving are examples of linear motion. Whenever something ends up in a different place, there has been “linear motion“. 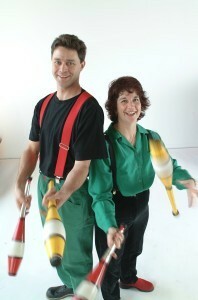 Greg and Kristi use juggling clubs as an example of linear motion. The clubs continually change their location during the routine. Rotation is another kind of motion.Rotating means spinning: things that arerotating turn around their centres. Rotating things behave differently from things that are not rotating. Objects that are spinning quickly don’t like to tip over. The scientific term for this is “angular momentum”. An example of angular momentum in life is a spinning top. Spinning tops don’t fall over when they are rotating quickly but they do fall when they slow down. Another example is a bicycle. 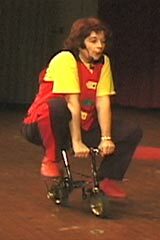 When you are riding a bicycle quickly the wheels are rotating, so they resist tipping over. Those rotating wheels help you keep your balance on a moving bicycle. When the bicycle comes to a stop the wheels are not rotating anymore, so they don’t mind tipping over. That’s a big part of why it’s so much easier to balance on a moving bicycle. Other forces can act on an object to slow down itsrotation. One of these forces is friction. When Greg spins a ball on his finger it eventually slows down because of the friction between the ball and his finger. Once it slows down it loses its “angular momentum” and it falls over. By placing the ball on a spinning drill instead of a finger, there’s no friction to slow the ball down and it stays spinning as long as we want it to. The blue rectangle to the right is rotating (spinning around its centre) but the green circle is NOT rotating. Although it is going in circles, it is not turning around it’s own centre. The green circle is turning around the blue rectangle instead. We call this revolving. The earth rotates on its axis once each day, and it revolves around the sun once each year. We have special terms for objects which move up-and-down or back-and-forth in a regular, repeating motion like a swing on a swing set or a piston in a cylinder. There are different terms to describe these kinds of motion, but in the Fizzical Fizzicks show we use the word “Vibration“. Things that swing (like a swing set or the pendulum on a clock) and the vibrations of a string like a guitar string are usually called oscillations. Other kinds of back-and-forth motion like a piston moving are often called reciprocating motion. In the diagram on the left the blue rectangle is performing a reciprocating motion (and the green circle is, of course, rotating). We are surrounded all the time by vibrations, and we don’t even realize it. Anything that travels in “waves” is vibrating. That includes water, and even sound. Sound travels through the air in waves which our ears can make sense of. Greg and Kristi found lots of tricks and toys which somehow involve oscillation or reciprocating motion. Greg combines several different vibration type motions together: he’s rocking back-and-forth on a rola-bola, he’s using a paddle ball to make a ball go up-and-down, and the ball on his hard hat is also vibrating due to a motor inside it. 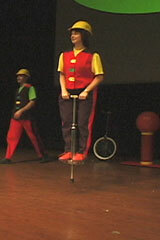 Kristi uses a pogo stick to help demonstrate that the three kinds of motion don’t always happen just one at a time. She combines linear motion (moving from place to place),rotation (spinning around), and vibration (going up and down) all at once while hoping that gravity doesn’t get the best of her. 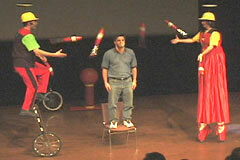 The show ends with another trick which uses all three types of motion at once. 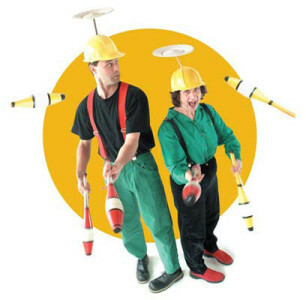 The juggling clubs demonstrate linear motion from place to place, there are plates rotating on those hard hats, and both Kristi and Greg are forced to make regular back-and-forth (vibration) movements stay up in the air (Greg on his unicycle and Kristi on her stilts). Linear motion, rotation and vibration… all at once!